The easy headline would be “Jim Kaighin tops field for fifth consecutive Marco Island win”. However, there is more to the story. Let’s start with the organizers of this year’s RC Laser Mid-Winter Championship at Marco Island bringing out a new format with a shorter duration and the class reacting with fifty percent greater attendance. The format called for Odd\Even racing all day on Saturday with scores carrying over to Sunday when the field would be separated into Gold and Silver fleets. Credit for the new format goes to class secretary, Nick Mortgu. After 14 Odd\Even heats were run on Saturday in a breeze that rotated 270 degrees to the right throughout the day, Jon Luscomb led the field by five points with a tightly bunched group of three, Bill Ewing, Jim Kaighin and Mike Kaighin, chasing him. While it’s common knowledge that Jim Kaighin tops the field of any RC Laser event with his vast experience, his brother Mike only races once a year and both Jon and Bill are relatively new to the class. On Sunday, the top 15 boats were placed in Gold fleet where the battles from Saturday continued. The lower 14 boats made up the Silver fleet where, in effect, a new regatta was born. Jim Kaighin’s recent form has been to kick it into high gear in the second half of regattas. Sunday would be no different. Winning four heats and keeping no score higher than a 5th made it tough for anyone to keep Jim from getting his fifth consecutive Marco Island win. Jon Luscomb hit a rough stretch early Sunday, but ended the day strong to wrap up second place only 6 points out of first. It took a tie breaker to separate Mike Kaighin and Chuck Weaver into third and fourth after Chuck really got rolling on Sunday. Bill Ewing finished his strong regatta in 5th place. In addition to the top five finishers, Rocky Cale, Frank Vella, Hank Buchanan and Dave Branning each won a race on Saturday. The top five took all the wins on Sunday. Hank Buchanan, who has sailed in every Marco Island regatta, sailed to eighth place competing from a stationary chair. A couple newcomers, Doug Hawksworth and Bill Bentz, joined him in the gold fleet. In one short year, Steve Lippincott has gone from newcomer to qualifying for the Gold fleet. Congratulations, all that RC Laser sailing in St. Petersburg is paying off. In the Silver fleet, the day started with Theresa Rae Gay and Roger Baldwin tied for first. It didn’t take long for Roger Baldwin to figure out this was to be his day. In one four race stretch, Roger took three wins. Theresa sailed well, but there was no catching Roger after that, who won Silver fleet. Henry De Wolf sailed great on Sunday with five top five finishes including two bullets to top Joel Krissoff in a tie breaker for third. The fun really came when it was time to hand out the Silver fleet trophies. Despite facing a 1,200 mile journey home in a vehicle that wasn’t exactly road worthy, Roger Baldwin had a smile that wrapped around his head. Days later, there were reports that not only did he make it home, but the smile had not gone away. He earned that win. Events like this don’t happen without a lot of effort from a lot of people. The entire Marco Island crew did a great job once again. Thanks to Dave Dumas, Harvey Spriggs and Mary Lee Cale for joining me on the Race Committee. Thanks to Don Harthorn for setting up that delicious dinner at Konrad’s. 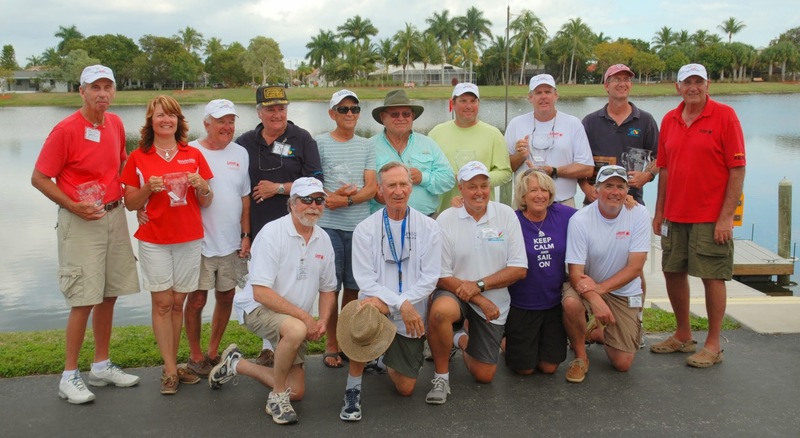 We now look forward to next year and the 13th Marco Island Mid-Winter Regatta. See you there. Nick’s Notes: As Dave Brawner mentioned great events just don’t happen. I was fortunate to attend four RC regattas in a two week period in FL. Three RC Laser regattas and the Soling 1M NCR. Dave Brawner was the Race Director at three of the four regattas. We all owe our thanks to Dave for his dedication to Radio Control Sailing.